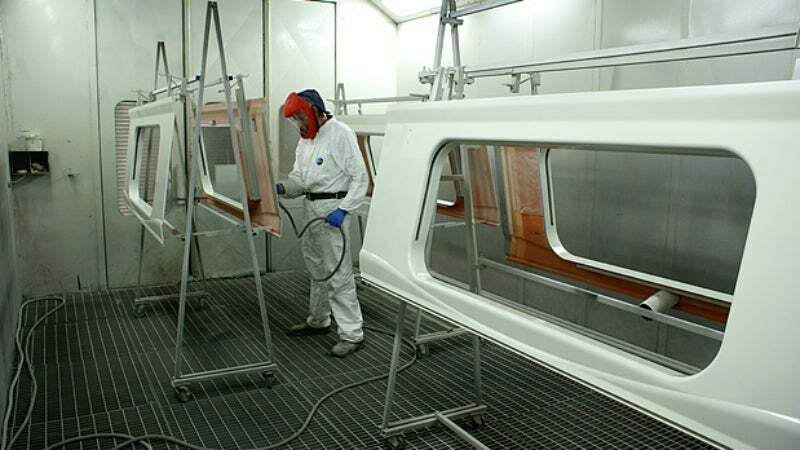 Mtag Composites specialises in manufacturing phenolic and polyester fibreglass, reinforced mouldings, and the painting, repair, and refurbishment of composite glass-reinforced plastic (GRP) panels. Mtag are based in Coningsby, Lincolnshire. We are a privately owned business with staff who have more than 25 years of hands-on experience in composite / fibreglass mouldings, as well as a wealth of knowledge from design to production mouldings for the mass transport industry. We pride ourselves in producing high-quality products, delivered on time to our customer’s requirements and at a very competitive price. In addition we are able to provide an advisory service for all your painting and moulding techniques. Mtag’s aim is to provide our customers with high-quality products from all aspects of our services. We ensure all of our customers receive a consistent supply of parts that match their requirements and are in line with the design and production quantity requirements of each composite. We currently supply painted phenolic GRPh components to Bombardier, Compin and Alstom, producing parts for their Victoria line underground, Lerl, Porterbrook, ELL, as well as west coast main line contracts amongst others. The majority of these mouldings are painted and fitted out, and then packed, crated and dispatched abroad to train builders in both the UK and abroad. Phenolic composites are chosen for their fire performance qualities, and meet BS476 parts 6 and 7, BS6853: toxic fume and smoke density standards. We produce these phenolic mouldings using our own vacuum infusion technique, hand lay-up and press methods. We also produce phenolic toilet module mouldings. With the majority of our staff having over ten years of hands-on experience in all types of glass-reinforced plastics, we are able to undertake many types of repair and refurbishment projects, whether onsite or at our factory. This includes interior and exterior train panels, including repainting in solvent or water-based systems such as Trimite, Du Pont or Mankiewicz. We also offer free on-site surveys and quotations. At Mtag we can offer a full pattern and mould building service to provide our customers with a one-stop-shop. We have close partnerships with two patternmakers, one being a traditional hand-built pattern maker and the other a CNC pattern builder which supplies patterns for rail and F1 customers. All our mould tools are built in-house by our staff. Within our specialist painting department, we are able to provide an exceptionally high-quality service. Our team are proud to offer in excess of 25 years’ experience, specialising in low-smoke, no-burn paints, working to specific gloss levels. The scale of our experience ranges from new work to repaints to refurbishment paintwork. Amongst a wide range of materials we are able to work on are phenolic GRP, aluminium steel and polyester GRP. For our painting we use a large-volume oven with high air exchange. Mtag Composites manufacture high-quality PHENOLIC, EPOXY and POLYESTER glass fibre and carbon fibre reinforced plastic mouldings, with a diverse product mix.